Is that a bird? A plane? 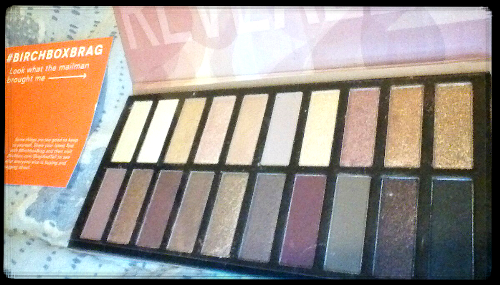 No, it’s Maybelline’s new The Nudes Palette sitting on my makeup drawer! 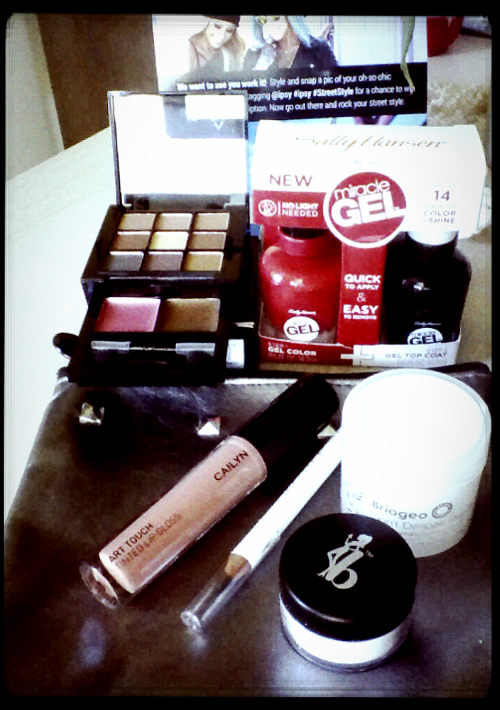 That, plus new Face Perfecting Brushes by EcoTools, a Beauty Blender, Maybelline Gel Liner (with brush) & an October Birchbox review. 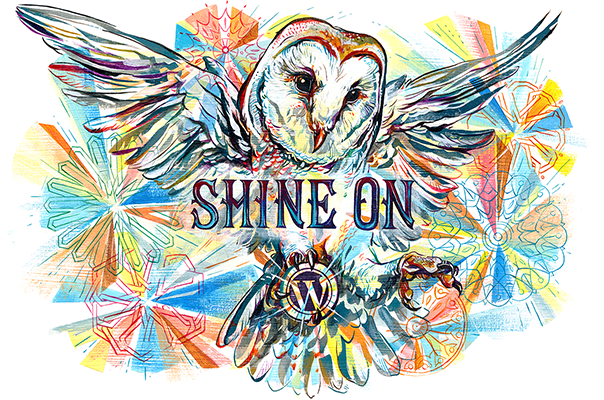 All posts soon to be coming to a blog near you (don’t look around, you’re already here!). I’m quickly becoming overrun with cute makeup bags, but, dudettes (& dudes, if ipsy is your thing), I can’t help but love the turquoise bag this month! It’s one of my favorite colors & the quilt-like design is perfect for Autumn. That , & I may be becoming a hoarder. Who knows… So, anyway, on to the goodies! First up is the skyn ICELAND Glacial Cleansing Cloths. A lot of ipsy reviews were critical of these wipes; either people said they were too harsh for sensitive skin, or said the wipes didn’t really get their skin clean. I have sensitive skin, so was weary the first time I used one…but ya know what? One cloth removed all of my makeup, wasn’t too harsh for my skin & smelled really nice afterward. Not an overbearing scent, but a light cucumber scent. I love these! Plus, I had just run out of my previous wipes, so the timing was great! Next up, City Color Be Matte Lipstick in Cappucino. To be honest, I wasn’t too excited over the color…until I tried it on. It looks like a 90’s, brown, lip color in the tube…but on? It’s more of a neutral lip color that goes amazing with my fair skin. Plus the product is cruelty-free. Another win! I’m always disappointed to get lotions in my subscriptions & I don’t know why! I always end up loving them! I’ve had dry skin since I was tiny & the weather up here does nothing to help that. With all that said, let me introduce Figs & Rouge Mango Mandarin Hand Cream. My dry hands’ new love for the upcoming horribly dry winter (ugh!). The company is from the U.K., which for some reason makes me feel a little high class (I’m weird, I know). It’s non greasy, smells amazing & a little bit of product quenches the dryness. I also like the tube it’s in. Love this hand lotion! Last, but hardly least, is the Doll 10 H2Glo Highlighter. Now, I’ve had a highlighter before, but never really liked it; it involved a lot blending & I never really achieved the look I was going for. I’m still a little shy using this particular highlighter, but it’s head & shoulders above my old one. Even the directions for the H2Glo Highlighter says “if you have to blend you’ve used too much“. I like straight forward directions like that! While I’m still getting the hang of this, I already love it! What all did you get in your Glam Bag this month? What was your favorite item? Let me know in the comments! After wearing almost every color in the Coastal Scents Revealed 2 Palette, I think an honest review is in order! 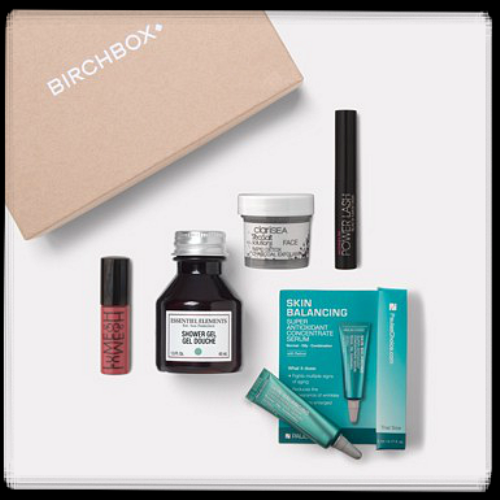 I was so excited to get this — I saved my Birchbox points for months just to get this puppy. It’s combination of matte & shimmery shadows in neutral champagne to rosy pink to deep berry (plus a true black! ), that looks so good! The possibilities are endless! The color lasted all day, which is one of the most important aspects of any makeup for me (I’m lazy, so reapplying eyeshadow throughout the day isn’t happening). Every color in the palette looks amazing once it’s on, too. There wasn’t one color that I didn’t like! & the black shadow has become a staple; I layer it over my eyeliner (I’m loving my Noir eyeliner from a previous Birchbox) on my waterlines & it helps my liner to stay put literally all day long. When I learned that little trick I did a happy jig, no lie! The down side to the Revealed 2 Palette is only, that to get the color payoff I was expecting, I feel like I have to cake the product on! Which leads to a lot eyeshadow fall out. Which makes frugal me a little disappointed. 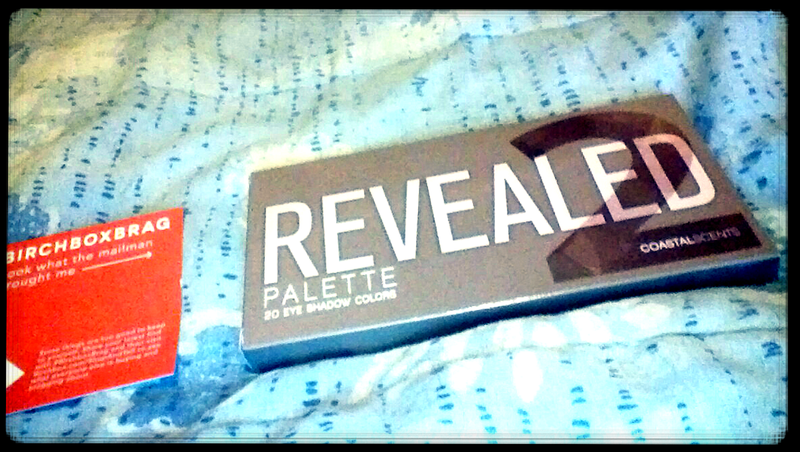 Have YOU tried the Coastal Scents Revealed 2 or Maybelline The Nudes Palettes? If so, what was your opinion? Best color combos? Nifty eyeshadow tips & tricks? Let me know in the comments! Full review in a few days! 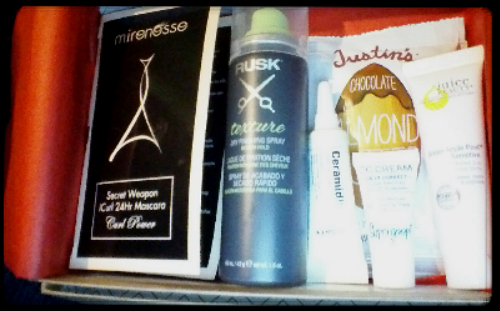 September was an amazing month for ipsy subscribers, I kid you not! & after last month, it should have been! Let me start by saying: I adore the Cailyn Art Touch Tinted Lip Gloss in Basic Instinct! Goes on smoothly, isn’t sticky like most lip glosses are & the color is beautiful! It didn’t even dry out my lips like other glosses do. I’d love to have more of this! There were two color options for the Pacifica Natural Minerals Eyeliner, a silver color & Fringe, a brown color. Thankfully, I received the brown! It’s a nice eyeliner pencil & I will get use out of it, but I don’t see what all the hype was over. In my opinion, it’s just your average eye pencil. As sneak peeks were being revealed, I hoped I’d get the Be A Bombshell Smooth Criminal Powder & lo & behold, I did! 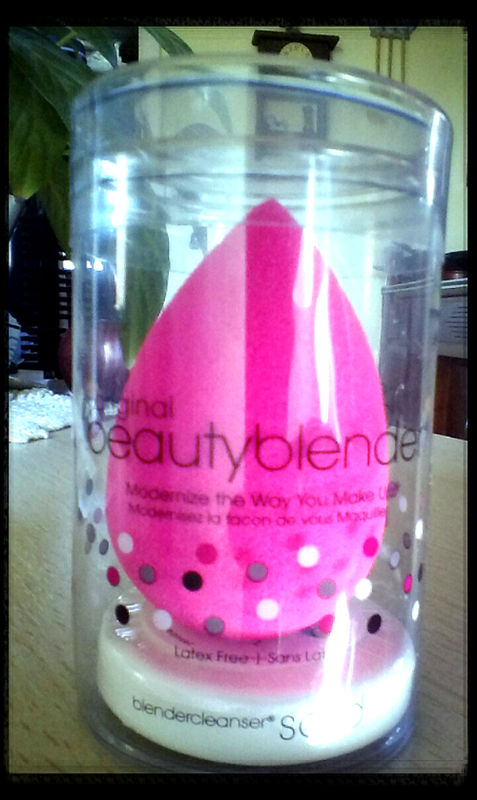 It can be worn alone to smooth flaws & reduce pores, or over makeup as a setting powder. Either way, I think it works wonders! Tried it over my makeup & didn’t have to touch up once! & by itself, it did smooth over some of my imperfections (not that I have all that many “imperfections”!). The final item from this month’s bag is Briogeo Don’t Despair, Repair! Deep Conditioning Mask. It smells good, but I don’t really like conditioners! I found Benefit Cosmetics through Birchbox last year when they sent me a deluxe sample of Benefit’s Hello Flawless Liquid Foundation (I wrote about that here) & have since fallen in love with their products. 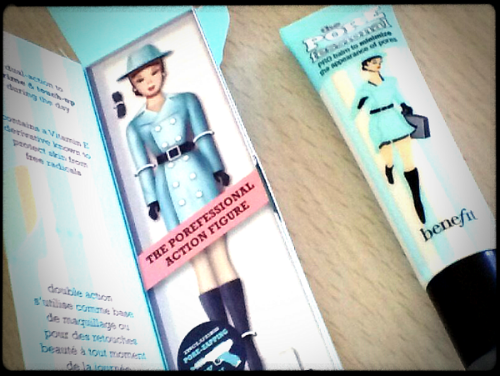 I’ve tried the samples of the POREfessional before & decided to get the full-size. It minimizes the look of pores & fine lines. You can wear it alone, or under make-up as a primer. It can also be used over make-up, too. I love this stuff! The POREfessional really can be used alone, but it also helps my make-up stay looking good, longer. No more touch-ups needed! It comes in a .75 US fl. oz. tube & costs $31, so I consider that a tad expensive, but it’s SO worth it, IMHO. In other news: my May ipsy bag ought to be here this week! Can’t wait! In this month’s IPSY Glam Bag I got a bottle of Nicole by OPI in On What Grounds. I didn’t know it was a textured polish until I put it on last night, but WOW! I love the color, and have fallen head over heels for the texture! It went on easy, wasn’t sloppy, and dried incredibly fast. Plus, I’ve gotten several compliments on my manicure.